CoolSculpting is an innovative, non-invasive way to contour your body by freezing unwanted fat away. CoolSculpting works by using a method called Cryolipolysis which uses cold temperature to break down fat cells. Unlike other types of cells, fat cells are particularly susceptible to effects of cold. 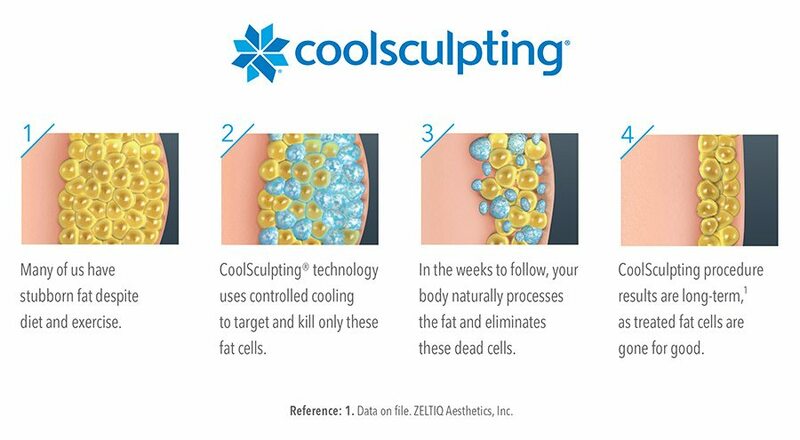 With CoolSculptingthe fat cells freeze and die while the skin and other structures are spared from injury. After a certain age and even when you lead a healthy lifestyle, diet and exercise may not be enough. If you have pinchable fat and have been struggling to lose this stubborn body fat, come in and find out if CoolSculpting® could be the solution you’ve been looking for. Non-surgical, no downtime, no needles … and it works! CoolSculptingis an FDA-cleared fat-freezing procedure. It is a non-surgical fat-reduction treatment that uses controlled cooling to eliminate stubborn fat in the abdomen, thigh, flanks, bra fat, back fat, under the chin, and underneath the buttocks (banana roll). The results are proven, noticeable, and lasting. During treatment, a gel pad and applicator are applied to the target area. Applicators that use vacuum will draw the tissue into the applicator cup, and then controlled cooling is delivered to that targeted area. You may feel a sensations of intense cold and possibly tingling in that area but this typically subsides within 5 to 10 minutes as the area becomes numb. Each treatment cycle takes 35 to 45 minutes. Most patients are comfortable and relaxed during treatments and typically complete several cycles during one office visit Once the applicator is removed, the area is massaged. Patients return to normal activities when the treatment is completed. Does CoolSculpting really work? When will I see results? Yes it works! While you may see results as early as one month, the most dramatic results are visible 3 months after treatment. Does it hurt? What are the side effects? Most patients feel some discomfort as the area becomes numb from cooling, but otherwise find the CoolSculpting procedure comfortable. Side effects may include tenderness, redness, swelling and possible bruising of the treated area. You could also experience skin sensitivity, tingling and some numbness to the treated area. These may persist for several days or up to two weeks after treatment. However most of these are minor, and patients are able to return to normal activity immediately after the procedure. What happens if I gain weight after CoolSculpting? We have found that most patients are motivated by the results they see after CoolSculpting and take better care of themselves. We always encourage a nutritious diet and an active, healthy lifestyle to maintain your new body contour.However, if you gain weight, the remaining fat cells may enlarge as they absorb excess fat.